Kudu is often said to be the best tasting game meat in the world and there is plenty available running wild in South Africa. It makes an amazingly tasty meal when prepared and cooked correctly. Here are some ideas on how to cook it and make sure to note that we have links to more exact recipes down below. 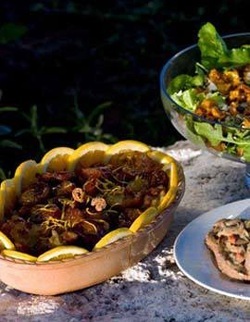 If you think Kudu is taste please click “like” above or leave a comment or recipe below. Kudu is a very lean meat making it a great fat free meal if you are on a diet or feel like eating healthy. Kudu can be bought in the supermarket (mostly here in South Africa) and is sold in cuts like steak. Kudu is a very dry meat, so cooking it has to be done with some care or it can get tough and difficult to eat. Here are a couple of recommended ways to cook it. Let it lay in yogurt for a couple of hours and then throw it on the braai (barbeque). Lay strips of bacon over the top to allow moisture to enter the meat. Since flavor mostly sits in the fats of meat, make sure that the bacon is not a super fatty variety and pass off the taste of pork to the dish and overwhelm the game taste. The yogurt will help take away some of the overpowering gamey flavor that put some people off and instead make the flavor softer. This is a good way to prepare the meal if children are eating with you. If you are in the bush, rub the steak with a little salt and pepper, cook it to a maximum of medium rare on open flame, and enjoy. If you are looking for a full recipe with measurements, you can find that here. An alternative to yogurt bath is marinating the steaks for a minimum of 24 hours in a wine based marine with all the spices your heart desires. Be careful not to overpower the flavor with too much garlic or salt. Some people say that you can marinate the meat in Coke with spices, but if you choose to do this, it will turn to ground beef if left in there for more than a couple hours. Finally, Kudu is also great in a casserole-like dish to make a stew which is known as Römertopf. Wild about you has a good recipe if you are looking for something more exact. A Römertopf is a Dutch word for a type of clay pot used for cooking (see picture). Chop up winter vegetables like carrots and potatoes, and cut up the steak into bite size pieces. Römertopf cooking keeps the nutrients and (importantly) the juices in the dish. This is a great warm wintertime alternative to the braai. Season the meat with salt and pepper and dust lightly with flour. Place a slice of ham and a sage leaf on each slice of veal and secure with a cocktail stick. Heat the oil in a pan and fry the meat for 1 to 1 ½ min on each side. Pour the wine and stock into the pan and reduce by half. Beat the butter into the sauce. 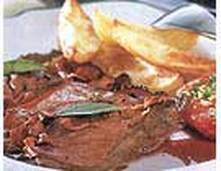 Spoon the sauce over the meat and serve with roasted tomatoes and potato wedges. Use 2kg of venison steak or any other steak if you don't have venison. You can use cuts from the loin, leg (topside or silverside) and shoulder. For this recipe you can really use any piece, since the tenderizing and marinade ensure that it is always soft. 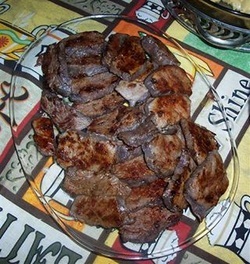 Cut steaks (allow two per person, depending on size) in 10mm thick slices and beat with mallet to tenderize the meat. Cover with olive oil and lemon juice. Sprinkle with mustard powder and barbecue spice. The steak can remain in this marinade for up to 3-4 days. Fry rapidly on a very hot metal steak pan on the fire or on a gas hob. Fry in searing hot butter for 30-60 seconds on each side of seal. Add the stock, carrots, celery,peppercorns, bay leaves, juniper berries and bouquet garni. Cover the casserole and bake in preheated oven at 150°C for at least 3 hours until tender. Strain stock off and reduce down to 2 cups and place meat and veg back into the stock. Soak the prunes in the port and set aside. In a hot frying pan saute the pancetta until lightly browned then add the onions and fry for a further 5 min - add the garlic prune and port mixture and season - bring to the boil. Combine the venison and prune mixture in cast iron pot or pie dish and check for seasoning. 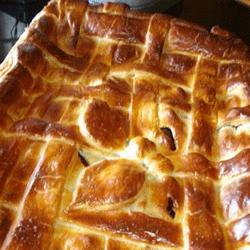 Cover with pastry - brush on an egg wash and bake in a pre-heated oven for 25 - 30 min.